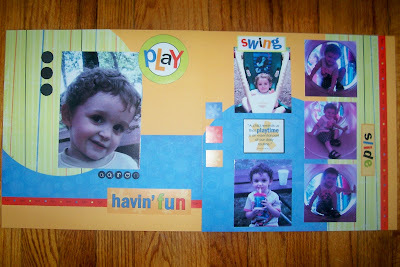 Confessions of a 20-something Scrapbooking Mother: What a great weekend! Just wanted to share a layout, some goodies, and a recap of our weekend! Be prepared for a LONG post!! Here's a layout of my little man. I don't know why the photos look blue, but they're not! Just another testament to my fine photography skills. ;) These were pics from our church picnic at a local park. Aaron had so much fun! I used a TLC kit for this layout. Everything is TLC-the paper, die cuts, and chipboard-except the little black letters. I think they are Doodlebug. This layout was a quick and easy, just the way I like it! Here are some Halloween goodies I got at Target for the boys Halloween pages. I took so many pictures, I'm sure I'll use every last bit of this stuff. Everything was on sale of couorse, or else I couldn't have afforded it! I got a ton of K&Co. stuff-the paper pack, buttons, letters, die cuts and epoxy stickers. They are all glittery too--Hooray for glitter! :) I also got MM epoxy letters, adhesive felt shapes, and some KI Memories stamps. The ribbon, brads, and small photo albums were a quarter each. Oh how I love Target!! I think the most expensive thing there is the stamps, and they weren't even $3. I'm going to use the little albums to document the boys in their Halloween costumes each year. I'm so crazy about those two! We had a pretty good weekend here. On Saturday, my mom and I went to a Consignment Sale. We had tons of fun and got a lot of great stuff. I've decided the boys are going to have a secondhand Christmas. They're young enough that they won't know the difference, and financially, if we didn't do it this way, we probably wouldn't be able to get them anything at all. We are also not really going to be able to buy for everyone else this year. I am going to make all of the adults a small scrapbook of the boys. I have 5 siblings, and there's no way we can buy each of them something. :( There's always next year though! Anyway, I am proud to say, that I AM DONE SHOPPING FOR THE BOYS!! I'm ecstatic. At the sale I got Aaron a Leap Pad with a ton of books for $5, I got quite a few books (they already have 2 full bookcases! ), DVDs still in the plastic, some clothes for both boys, including a onesie for Alex that says "Photos with Baby-50 cents" and has a camera on it! SO CUTE! I also got myself a few shirts and a pair of jeans for basically nothing. I got the new Nora Roberts book for $1! I was so excited. The cheapest I had found it was $20 at Walmart, so I'm thrilled. I started reading it Saturday night and finished it this morning. It was so good! We got so many great deals, and everything was in perfect condition. It was great. And what made my weekend even better? I won a subscription to Paper Crafts from Angel!! I think I talked about it all night long. My husband had no idea what I was talking about, but that's ok! Paper Crafts is by far my favorite magazine. I had so much fun participating in the Rainbow Days of Angelosity challenges. Angel really got my creative juices flowing, and I feel like I'm a whole different crafter! Thanks Angel!! I am beyond ecstatic. I feel so very lucky. You should go check out Angel and Michelle's blogs. They are both so talented! So that's all of my weekend fun. :) Aaron has had a fever since yesterday, but I have a feeling he is getting some new teeth in the back of his mouth. I laid in bed with him all day long yesterday and cuddled him. I didn't get anything done that I needed to, but I loved spending the whole day with him! Alex even came and laid with us for a while too. I just love being their mama! What could be better than spending the whole day warm and cozy in bed with the 2 cutest boys ever?! Thanks so much again! It's great stuff and I'll be doing the 2nd hand Christmas too, and crafty too. I have 3 siblings and my husband has 3 so it makes for too many gifts, the economy is hurting and I don't have the money to splurge. So I'll be making alot of the grownups their gifts and getting few for the kids... ugh.. I hate times like these! LOVE the layout, you got FANTASTIC stuff at Target (I love, love, love Target too! ), and wow on all of your consignment sale finds! I love sales like that! Congratulations on the Paper Crafts magazine win (love that magazine), and on your other blog candy win! You're on a lucky streak Becky!! You go girl!! There's nothing wrong with a second hand Christmas. The kiddos won't even know the difference. Your pages look great and I'm loving those Target finds. Wow- you got some goodies at Target! I need to go shopping with you! That's crazy. Is it a small town? Michaels is okay thay take anyones coupons so they price match that's good. I like HL though. I'm sorry, that stinks that the selection isn't too great. I like to online shop too because you can find some great deals sometimes. I am deciding on whether or not I join a kit club, I like the idea od not knowing what I'll get from month to month, I just have to find a cheap but great deal on one! Haha. Don't feel too bad about not having a HL, their paper prices just went up! Ugh. Lakeside.com has some good papers every once and a while too. Hi. Cool blog. I just got into scrapbooking this year. It's so much fun. What a sweetheart on that lo! Have a super time at twilight!